Flair's 2-in-1 Sticker Magic has been a big hit in our house ever since it's first use. My children love doing crafts and love stickers so this is perfect for them. The idea behind 2-in-1 Sticker is that you can turn drawings and pictures into stickers or laminate them. It is a great way for kids to make their very own personalised labels, stickers and fun bookmarks amongst other things. The set comes with an easy to assemble and operate laminator and sticker maker in one machine along with a paper roll (10m), a sticker paper roll (6m), a clear tape roll (20m), a scissors and two designs sheets which contain a selection of pictures including label templates which you can cut out, personalise and use. It is worth noting that you can purchase refills online when you run out. Ben absolutely loves the Flair's 2-in-1 Sticker Magic machine and it has become one of his favourite craft activities to do. On his first go he quickly got to work drawing pictures which could be turned into stickers. He made stickers for me, Daddy, his brother and sister, friends at school and a special label for his homework folder. It is easy to use and operate but one tip, to avoid wasting the sticker roll it is best to get a bunch of sticker designs or pictures ready and do in a batch as this ensures that you do not have excess waste. I can definitely recommend Flair's 2-in-1 Sticker Magic as it makes for a fun craft activity to entertain kids with the bonus of virtually no mess for parents to clear up and a useful personalised product created in the end. It is easy to operate and use, inspires creativity and most importantly is fun for kids. Flair's 2-in-1 Sticker Magic is available to buy from the usual toy retailers including Smyths Toys and Amazon priced at £19.99. 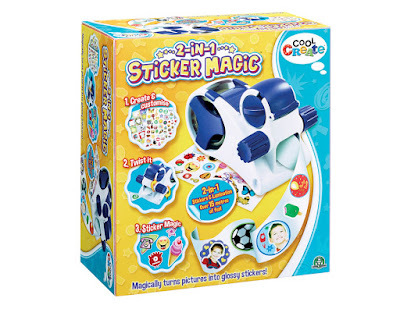 Flair's 2-in-1 Sticker Magic is one of many brilliant creative toys and sets available from Flair which are great for children of all ages. For all things creative, competitions and more, children can sign up to the Cool Create Club online and parents can follow @CoolCreateClub on Facebook and Twitter. *Disclaimer: I received the Flair's 2-in-1 Sticker Magic set in exchange for a review. All views and opinions are my own and unbiased.